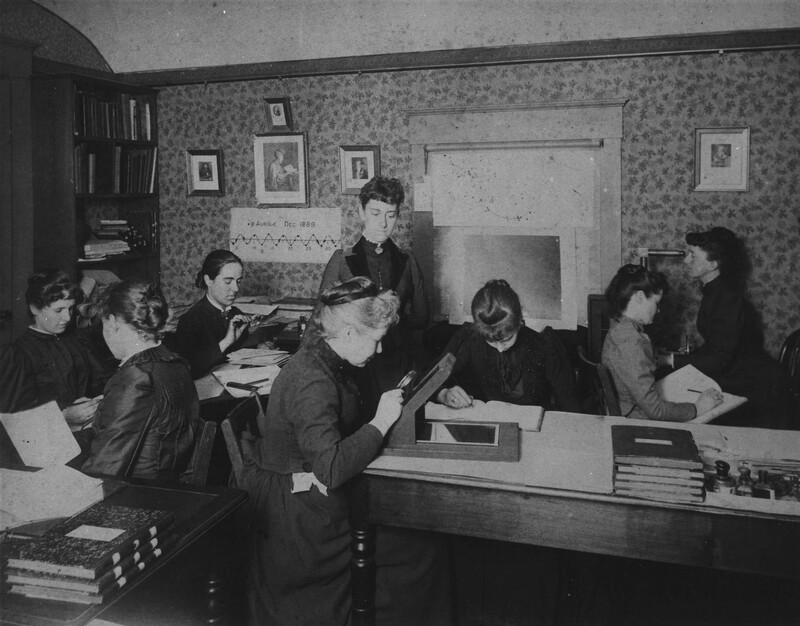 From 1877 to 1919, the Harvard Observatory hired women as “human computers” to process astronomical data. Despite their college degrees, they earned wages similar to those of an unskilled worker. To view this photo in context and to read more about these “human computers,” see this Smithsonian article about the Harvard Observatory in the start of the 20th century. This photo comes from Harvard University and is titled “Astronomer Edward Charles Pickering’s Harvard computers” and is authored by the Harvard College Observatory. It can be found in the Wikimedia Commons and is now in the public domain because it was published before January 1st, 1923. In November 1903 Mary Anderson, pictured above with her patent drawing, was granted a patent for an automatic car window cleaning device that is now known as the windshield wiper. To view the photo in context and for additional reading about Mary’s invention, see this story about Anderson’s invention, which was posted on the U.S. Patent and Trademark Office’s website. The photo pictured above was posted to the U.S. Patent and Trademark Office in the article from the above link by Dennis Forbes. Further information is unknown. 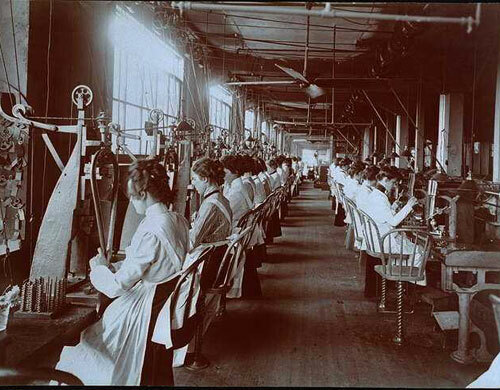 Many women in the early 20th century interacted with technology while working in crowded factories. Such women are pictured above using machines to assemble locks and drills in an Ohio factory in 1902. For additional reading about women at work in the 1900s, check out this timeline from the Discovery Education. This photo is possession of the Detroit Photographic Company and was taken by William H. Jackson in 1902. The ID number in DPC’s archive is 04756. After working in the Columbia Paper Bag Company in New England, Margaret Knight invented machinery that would do a better job of folding the bottom of square paper bags. 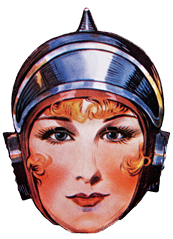 She went on to invent other devices, all patented between 1902 and 1915. For more information on Margaret Knight’s inventions, see her biography, posted on the National Women’s History Museum website. 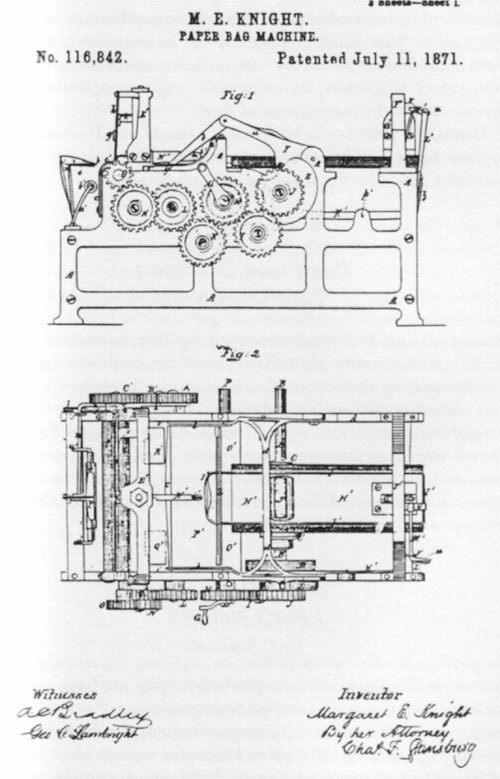 The illustration above shows the patent design for her paper bag machine. The graphic can be found on a website sponsored by CSU Pomona. All other information about the image is unknown. Women worked with technology as telephone operators from 1878 through the 1960s. 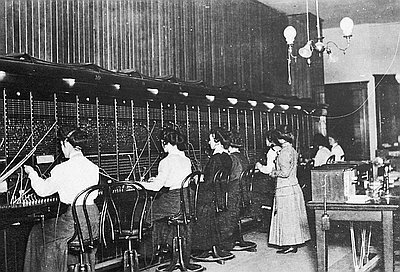 By the year 1900, women made up 80% of telephone operators. This year fell in the middle of a job growth period for women–many of these jobs involving technology. To read more on women’s technological growth in the workplace, see Christine Bose’s book, Women in 1900: Gateway to the Political Economy of the 20th Century. The photo above was taken between 1900 and 1915 of telephone operators in Baker City, OR. It is owned by the Oregon Historical Society. Its catalog number is OrHi75739. 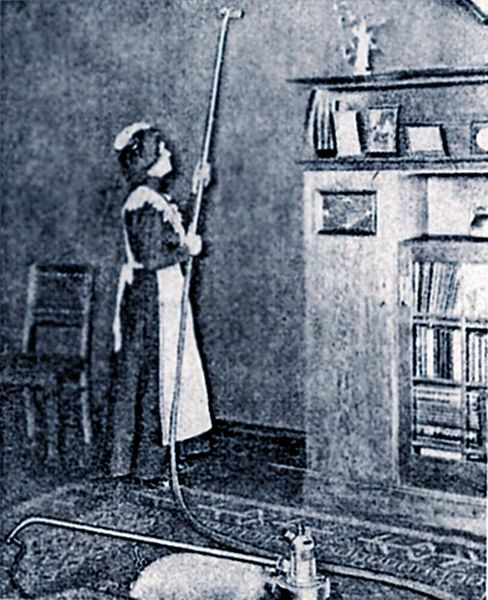 The first vacuum cleaner was invented in 1901 by Hubert Cecil Booth. Although the invention was supposed to be an easy tool to aid in housework, the first design was too big to fit in a regular home and had to be completely redesigned in the next year. 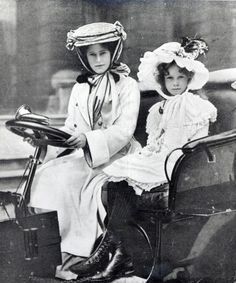 The image shows Millicent, Duchess of Sutherland and her daughter attending the first Ladies Automobile Club meeting in 1903. The club was formed in response to the Royal Automobile Club refusing to let females join. More information can be found in this chapter from The Car and British Society: Class, Gender, and Motoring. In 1905, the first nickelodeon was opened to the public costing only a nickel to view a film. 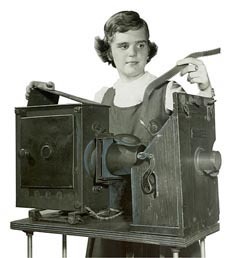 Above, Cynthia Hahn, granddaughter of John P. Harris, operates the first nickelodeon invented by her grandfather. For further reading on the history of the Nickelodeon, visit Pittsburg’s Post-Gazzette’s website. Photo Courtesy of Los Angeles Time, circa 1909. 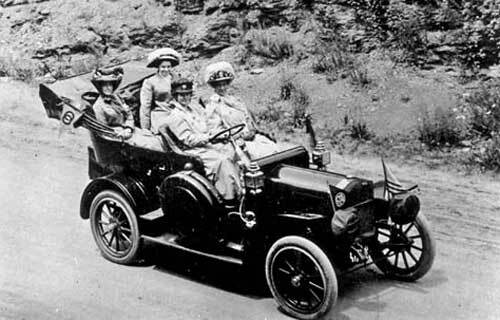 In 1909, Alice Huyler Ramsey along with three other women began a cross country road trip across the United States in one of Ford’s first model T cars. The photo above shows the group on their trip. To learn more about Alice Huyler Ramsey and her expedition, visit blogger Rebecca Hensley’s page. Photo Courtesy of Kheel Center, Circa 1900. 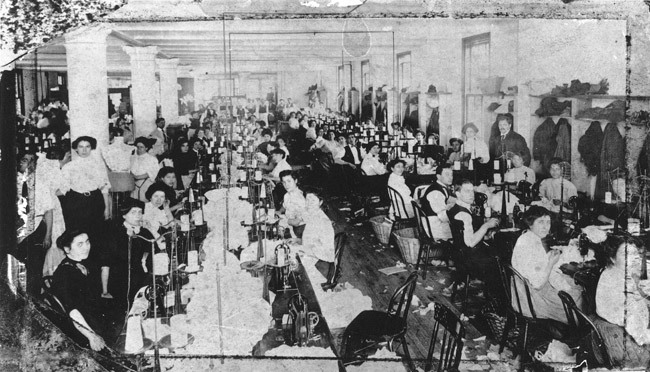 The image above shows women at work using sewing machines in the textile industry during the early 1900s. With the development of the sewing machine, the garment manufacturing industry nearly doubled between 1900 and 1910. For more information on the invention of the sewing machine, visit the International Sewing Machine Collector’s Society official website.